I saw an author describing the J curve on TV a few years back. I couldn’t find reference to the concept in an internet search, so I cannot give appropriate credit to the original author. The gist of it is that to move from a dysfunctional to a functional government, an authoritarian system will only take you so far. To really take advantage of the skills and creativity of the entire populace, and truly move your community forward, you have to move to a freer society. Unfortunately this will often lead to a temporary regression, since you probably will move down on the J curve before you move up again. This also explains why democratic governments are often reluctant to support freedom movements in dictatorial societies. The uncertainty that will follow the ouster of a dictator will yield uncontrollable and unpredictable chaos before a more democratic society emerges (if it does). Complete freedom and self-expression for all members of a community, even in a reasonably free and democratic society, is still most likely a pipe dream, since including all marginalized members is costly. Just recall objections that have been raised to laws that require accommodating the handicapped or non-English speakers. To me, this also explains a lot in education. 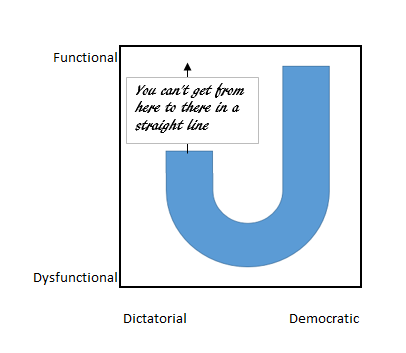 Education, as it is currently conducted, definitely falls on the authoritarian side of the curve. Those students who are marginalized, defiant, suicidal, or just not thriving are the casualties who are telling us in no uncertain terms that the system is ignoring their needs Students are often expected to learn pre-packaged content and regurgitate it on standardized tests. Charter schools, rather than improving this situation (in my limited direct experience) can be even more regimented than traditional public schools. Students who don’t adapt to the charter’s approach are sent back to public schools. In tracking one “successful” charter high school I noticed that the school accepted 100 students in grade 9 and the class had fewer than 50 students in grade 12. Yes, those remaining students were all accepted to college, but what happened to their classmates who dropped out or went back to traditional public school? This is not a success model. But these are children you say. They need to be led and guided. Thinking back to the book “Why Motivating People Doesn’t Work…and What Does” by Susan Fowler, it is not just adults that need autonomy, relationship and competence. We need to shift our focus from “a college-going culture” and create environments where children can be supported to develop a more self-directed educational experience. Well, that’s my humble opinion, anyway. Sure, I work on the business side of things. But I am also a parent. And all of us were students at one time or other. As users of the educational system (as well as its funders), our experiences do matter.